Television news almost censored the heroic action of 4,000 students from 18 States whose agenda too was anti-corruption. ARUNODAY MAJUMDER questions the rationale for this indifference towards “Young India”. Dronacharya (Editor): What do you see through the view-finder of your camera? Arjuna (Reporter) : I see students. Dronacharya : Do you see all of them? Arjuna : No, I see some of them. Dronacharya : Do you see students fighting for the rights of tribal people and workers? Arjuna : No, I do not see them. Dronacharya : Do you see students fighting against land-grab and corporations? Dronacharya : Do you see students marching to Parliament to raise these issues? 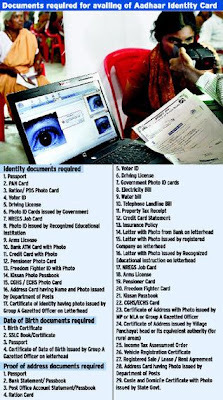 New Delhi, 23 Aug: Arindam Chaudhury, Editor-in-Chief of The Sunday Indian (TSI) in an editorial piece titled ‘Why the UID card should be made every citizen's constitutional right’ states, “...in its current form, the project is more of a political initiative of the UPA government, like their other developmental projects – which simply means that in the near future, it can be abandoned or can be stopped by any other political party in power.” This has already happened in UK. Democratic mandate is against projects like UID and related initiatives like National Population Register (NPR), National Intelligence Grid, Human DNA Profiling, National Counter Terrorism Centre (NCTC), Land Titling Bill, 2011 and Public Information Infrastructure and Innovations. He was an Ismaili and Ismailis are generally not considered a part of mainstream Islam .And while being an Ismaili, it was not easy to win over the Muslim constituency of India, he converted to Shiaism (Asna ashri). However he cherished ham sandwiches and high quality liquor, nevertheless he made sure that the vast Muslim community remained unaware of it. On the eve of the Independence Day, President recalled in his maiden speech the observations of “Netaji, as Rashtrapati of the 51st Session of Indian National Congress in Haripura, on the banks of the river Tapti” 74 years ago in Bardoli district of Gujarat. Cabinet Committee on Unique Identification Authority of India related issues Composition Prime Minister. Shri Sharad Pawar, Minister of Agriculture and Minister of Food Processing Industries. Shri P. Chidambaram, Minister of Finance. Shri S.M. Krishna, Minister of External Affairs. Shri Sushilkumar Shinde, Minister of Home Affairs. Shri Mallikarjun Kharge, Minister of Labour and Employment. Shri Kapil Sibal, Minister of Human Resource Development and Minister of Communications and Information Technology. Kumari Selja, Minister of Housing and Urban Poverty Alleviation and Minister of Culture. Shri Salman Khursheed, Minister of Law and Justice and Minister of Minority Affairs. Shri Jairam Ramesh, Minister of Rural Development and Minister of Drinking Water and Sanitation. Special Invitees. Shri Montek Singh Ahluwalia, Deputy Chairman, Planning Commission. Shri Nandan Nilekani, Chairman, UIDAI. I salute you for recalling in your speech on the eve of Independence Day that India had 24.5% of World Manufacturing Output before our independence was snatched away by British East India Company, an entity created by Queen Elizabeth I through a royal charter on December 31, 1600. Our current share in manufacturing output is 2.2%, as per UN National Accounts Main Aggregates Database, 2010. As a fellow citizen, I hope that you will consider preparing a blue print for gaining pre-1750 position for our country in world trade. I wish to draw your attention towards advertisements dated August 14, 2012 in the newspapers regarding Home Ministry’s National Population Register (NPR) and World Bank’s eTransform Initiative. The advertisement is attached.